A seat includes all Iron Speed Designer product keys and product versions, including those received with a software update subscription. Transferring a seat to someone transfers all product keys and versions associated with that seat. Once transferred to a new user, the previous user cannot use any of the associated product keys and versions. The current OWNER can transfer both the named user (developer) and owner (administrator) for a seat. Your assigned developer has left your organization or has moved on to other projects. You wish to pass administrative ownership of a seat to another administrative owner. Once ownership has been transferred, you no longer control the seat and its associated product versions. If you are both the owner and named user of the seat, you must re-assign both to fully transfer license ownership rights to another user. Please note that Iron Speed must approve all transfers before they become effective. Step 1: To transfer a seat to a different NAMED USER, uninstall all versions of Iron Speed Designer associated with that seat from the current named user's machine. Once the seat has been transferred, the prior named user will no longer be able to use any version of Iron Speed Designer associated with that seat. Step 2: Go to http://support.ironspeed.com and sign in with your email address and password. If you do not remember your password, you may request another. Step 3: Select the ‘Seats’ menu. Step 4: Click the ‘Change Named User’ button and enter the new user's email address. Step 5: (Optional) To transfer administrative OWNERSHIP to someone else, click the ‘Change Owner’ button and enter the new owner's email address. Once you transfer OWNERSHIP, you no longer have administrative rights to this seat. Step 6: Our system will send an email confirmation to all parties involved in this transfer, including the previous owner, the new owner, the previous named user and the new named user, as appropriate. 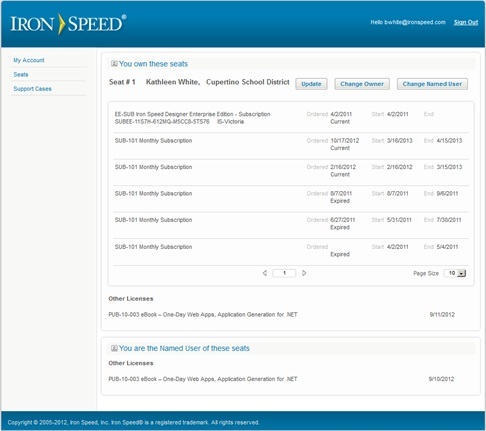 Step 7: Contact your Iron Speed account manager to confirm transfer approval.